Some oriental plums are self-sterile and require a pollinizer. Santa Rosa is a good pollinizer for most oriental varieties. Peach seedling and myrobolan are used as the standard rootstocks for plums and prunes. St. Julian A and Siberian C are used as semi-dwarfing rootstocks. Beauty - Heart-shaped fruit is medium to large, greenish-yellow to bright red. Very low chill. Ripens early. Ripens late May, early June. Self-fertile. Burbank - Japanese variety for canning and fresh fruit market use. A large reddish-purple plum that is quite firm and meaty. A heavy producer. Low chilling requirement. Ripens July. Elephant Heart - Large, heart-shaped fruit with dark reddish-purple skin. Flesh is purple-red, freestone, sweet and juicy. Ripens late July through mid August. (Late/needs pollinizer). (image)​. Mariposa - Large, purple-red fruit overlaid with glowing lilac bloom. Blood-red flesh. Tender, juicy and very sweet. Keeps well. Low chilling requirement. One of the best backyard varieties, especially in CA. Partially self-fertile. For best results, pollinize with Santa Rosa. Ripens early July-early August. (image)​. 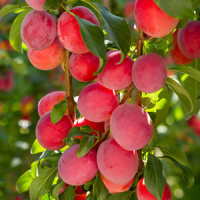 Peach Plum - This large, attractive fruit is excellent fresh for dessert and also for canning. Fruit is roundish; skin purplish-red. Flesh is golden-yellow. Ripens July. Santa Rosa - One of the largest and most beautiful of the Japanese plums. Yellow flesh, delicious flavor, fragrant and juicy. Low chilling requirement. Best backyard variety. Round, uniform in size and a good shipper. Skin is dark crimson. Good pollinizer. Ripens early June to early July. (Early/self-fertile). Weeping Santa Rosa - Same superior quality fruit as Santa Rosa. On a small gracefull weeping tree. Very attractive and ornamental, excellent in containers. 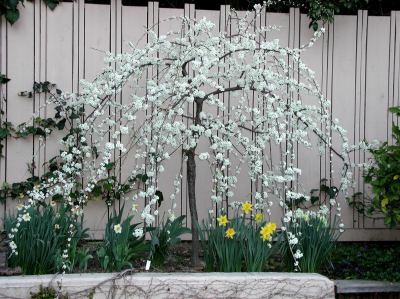 Delicate white flowers show well for two plus weeks. We find this variety to have much fewer problems with birds and squirrels. (Early/self-fertile). Santa Rosa, Late - Medium to large fruit with reddish-purple skin and yellow flesh. Flavor is tart and flavorful. Harvest 1 month after Santa Rosa. (Mid-season/self-fertile). Satsuma - Japanese type with deep red skin and flesh. Juicy, good flavor; ripens over 2 to 3 week period. Sometimes bears very heavily. Ripens late July through August. (Mid-season/needs pollinizer) (image)​. Shiro - A very early Japanese plum with beautiful yellow color and excellent flavor. It matures before other yellow plums and so becomes profitable for local markets. Extremely productive tree that needs pollinizer. President will not pollinize. Ripens early June to early July. (Early/needs pollinizer). 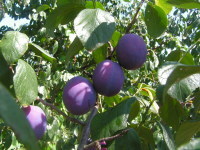 Most European plums are self-fertile. 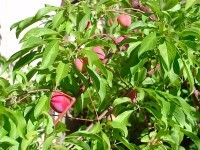 Peach seedling and myrobolan are used as the standard rootstocks for plums and prunes. St. Julian A and Siberian C are used as semi-dwarfing rootstocks. Brooks - Tree breaks early and is a heavy producer. Fruit is large and oval in shape. Skin color is purplish-black. Prune is sweet with some acid. Oregon prune, good for drying and canning. (Late/self-fertile). French Improved Prune - This late-season prune is medium, long and oval. Fruit is dark purple with sweet, mild-flavored flesh. Good for drying, but too sweet to can. Ripens late July to mid-August. (Late/self-fertile). Green Gage - Small to medium greenish-yellow plum, with amber flesh. This very sweet plum is good for eating fresh, canning, freezing or making jam or preserves. Hardy, easy to grow tree which fruits freely. Considering it's quality fruit and ease of growth this variety should be a more widely planted home variety. Ripens early July to early August. Low chill. Stanley Prune - Very popular, Italian-type prune that is very hardy. Fruit is large, dark blue; and flesh is greenish-yellow, juicy and fine grained. Excellent for home use and processing. It can be counted on to produce fall annual crops. Yellow Egg - Another excellent, easy to grow variety for the home gardner. A late European Plum producing large, golden-yellow fruit with opaque, juicy flesh. Very sweet, thin skinned and freestone when fully ripened on the tree. Since this fruit must be picked hard and at least one week early to ship to market, store bought fruit taste is poor at best. Naturally semi-dwarf tree. Hardy and very productive. Ripens August.